In the U.S., hanging out in a cafe with animals is such an exotic concept that people can’t get enough of it. A pop-up cat cafe in New York last year had lines down the block. Online reservations for another Manhattan cat cafe are almost fully booked more than two months ahead. But in Japan, cat cafes are just the start. You can hang out in rabbit cafes or have coffee in Tokyo with two goats. And you’re not limited to domestic animals. You can also spend an hour at a cafe holding a great horned owl. 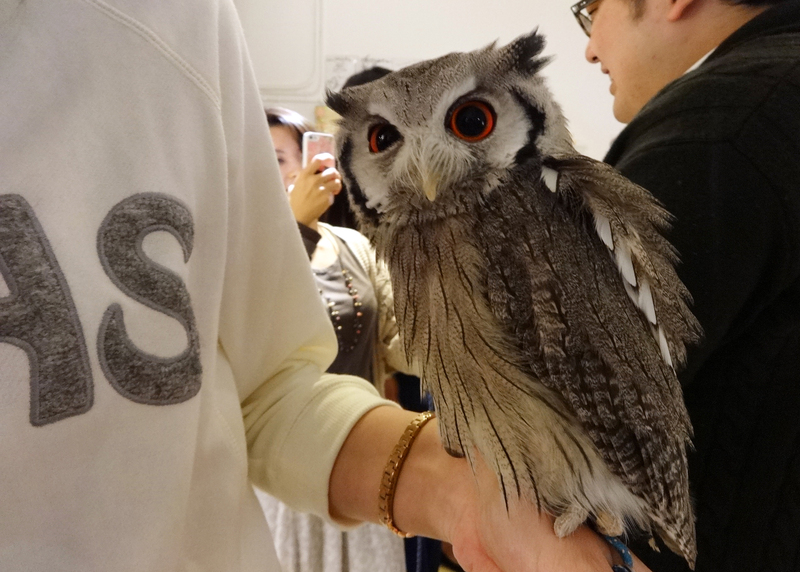 Judging by how complicated it was to get a reservation at Tokyo’s Fukuro no Mise (Shop of Owls), the owl cafes are just as much of a hoot as cat cafes in the U.S.
To get a spot, visitors are supposed to line up an hour before Fukuro no Mise opens. But when I showed up an hour early, I was lucky to get the last seat for a session two hours later. There are no refunds on the ¥2000 fee. If you’re late, you lose your slot. Inside, I was given a list of detailed English instructions. For example, only touch the owls on the head or back. And while the owls are very tame, “they can’t be potty trained like dogs. So please be generous when they potty on you!” The woman in charge also gave a long talk and demonstration in Japanese before allowing each guest to hold a bird. Unlike some other animal cafes in Japan, this place is only nominally a cafe. There’s no food but a small drink is included (alcohol costs extra). The drink arrives covered in plastic wrap, decorated with a magic marker illustration of an owl. But no one pays attention to their beverage until the final activity, which involves distributing souvenirs. Each item is held up and guests raise their hand if they want it. If too many people raise hands, winners are chosen by playing rock-paper-scissors. Souvenirs included a photo book, cell phone charms, chopsticks and a cloth decorated with owls. 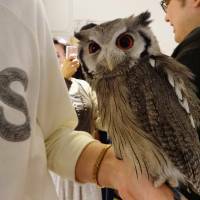 If owls aren’t enough to satisfy your longing to commune with birds of prey, there’s also a Falconers Cafe in Mitaka, western Tokyo, the same area as the Ghibli Museum. When it’s not busy, the only birds there will be the owner’s, four Harris hawks and a peregrine falcon that can’t be petted, only watched. But hawk owners also come to the shop with their birds, and some may allow you to touch them. This one’s a proper cafe, with dishes on an English menu named after raptors, including Harris Curry and Eagle Ginger pork. For more information about pet cafes — from goats to owls and reptiles — see our City Guide round-up.